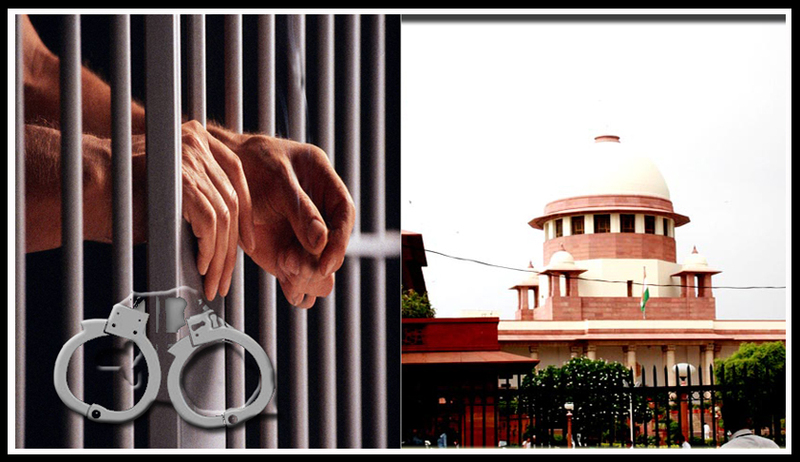 Omitted Section 438 Cr.P C for anticipatory bail [in UP] cannot be resorted to as back door entry via Article 226, Says Supreme Court. Supreme Court observed that the power under Art.226 is not to be exercised liberally so as to convert it into Section 438, Cr.P.C. proceedings in an appeal seeking the direction in the nature of Mandamus to defer the arrest of the petitioner until collection of the credible evidence sufficient for filing the charge-sheet. The High Court dismissed the writ petition and the appellant approached Supreme Court contending that the High Court had failed to exercise its jurisdiction under Article 226 of the Constitution of India in not quashing the FIR and in refusing to grant anticipatory bail to the appellant. Supreme Court held that even though Section 438 has been specifically omitted and made inapplicable in the State of Uttar Pradesh, a party aggrieved can invoke the jurisdiction of the High Court under Article 226 of the Constitution of India, being extraordinary jurisdiction and the vastness of the powers naturally impose considerable responsibility in its application. But once the Court finds no merits in the challenge, writ petition will have to be dismissed and the question of granting further relief after dismissal of the writ does not arise. Consequently, once a writ is dismissed, all the interim reliefs granted would also go. Justice A. K. Sikri who wrote a separate but concurrent judgment has observed that a power under Art.226 is not to be exercised liberally so as to convert it into Section 438,Cr.P.C. proceedings, keeping in mind that when this provision is specifically omitted in the State of Uttar Pradesh, it cannot be resorted to as to back door entry via Art.226. Justice Sikri is in a view that the High Court should balance the two interests. On the one hand, the Court is to ensure that such a power under Art.226 is not to be exercised liberally so as to convert it into Section 438,Cr.P.C. proceedings and on the other hand, wherever the High Court finds that in a given case if the protection against pre-arrest is not given, it would amount to gross miscarriage of justice and no case, at all, is made for arrest pending trial, the High Court would be free to grant the relief in the nature of anticipatory bail in exercise of its power under Art. 226. It is clarified that this power has to be exercised sparingly in those cases where it is absolutely warranted and justified, Justice Sikri said. A seven-Judge Bench of the Allahabad High Court in Smt. Amarawati and Ors. V. State of U.P. (2005) Cri.L.J. 755, , while interpreting the provisions of Sections 41, 2(c) and 157(1) CrPC as well as the scope of Sections 437 and 439, held that even if cognizable offence is disclosed, in the FIR or complaint the arrest of the accused is not a must, rather the police officer should be guided by the decision of the Supreme Court in Joginder Kumar v. State of U.P., 1994 Cr LJ 1981 before deciding whether to make an arrest or not. In 2008 a two-Judge Bench of Supreme Court in Som Mittal v. Government of Karnataka (2008) 3 SCC 753, while dealing with an order of the Karnataka High Court under Section 482 CrPC, one of the Judges made some strong observations as well as recommendations to restore Section 438 in the State of U.P. Learned Judges constituting the Bench also expressed contrary views on certain legal issues, hence, the matter was later placed before a three-Judge Bench, the judgment of which is reported in same caption (2008) 3 SCC 574, wherein Supreme Court opined that insofar as the observations, recommendations and directions in paras 17 to 39 of the concurrent judgment is concerned, they did not relate to the subject matter of the criminal appeal and the directions given were held to be obiter and were set aside. Though the Code of Criminal Procedure (Uttar Pradesh Amendment) Bill 2010 passed by the Legislature paving the way for the restoration of the provision of anticipatory bail, the President had withheld the assent.